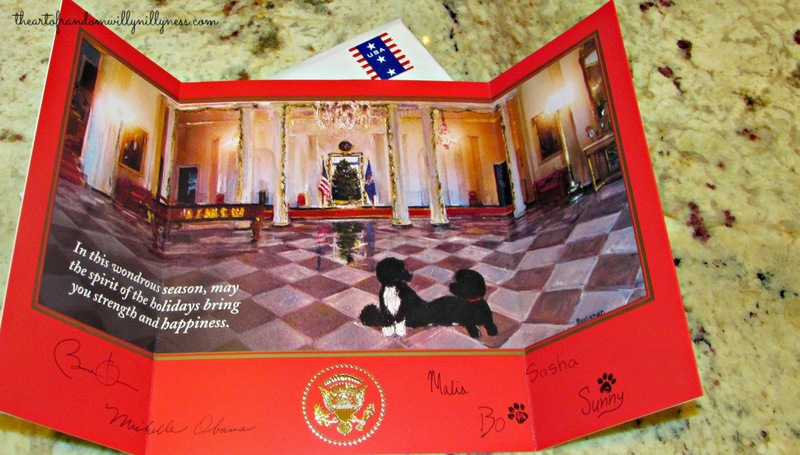 PRESIDENT OBAMA, THE PROFESSED CHRISTIAN, DARED NOT SEND A WHITE HOUSE CHRISTMAS CARD DEPICTING THE NATVITY. INSTEAD HE REPLACED THE VIRGIN MARY AND THE CHRIST CHILD WITH THE OBAMA FAMILY DOGS. Today is the first day of Advent, which marks the start of the pre-Christmas season. It is observed by many, if not most, of the Catholic faithful. And it is in popularity among Protestants, particularly those of us who count ourselves evangelical Christians. Advent begins four Sundays before Christmas and ends on Christmas Eve. During that four-week period, the Christian faithful prepare for the commemoration of the birth of Christ. Satan hates Advent. That’s because he wants to take the “Christ” out of Christmas. He doesn’t want Christmas to be a Godly “holy-day.” Rather, his aim is to reduce the birth of Christ to an unGodly, secularized “holiday,” on a par with, say, Halloween. And, lamentably, Satan and his minions have largely succeeded in hijacking Christmas. Indeed, no longer is Christmas a celebration of Christ’s birth, but the worship of Mammon. It begins the day after Thanksgiving, which is aptly named Black Friday. It is a day of orgiastic buying and selling in America’s temples of commerce. Meanwhile, the evil one’s useful idiots have driven Christ out of the public square during Christmas. And Obama is not the only elected official doing the work of the devil; taking the Christ out of Christmas. Then there are the atheists, and their sympathizers, who use the courts to attack Christmas. That’s what happened this past April when a three-judge panel of the liberal Ninth U.S. Circuit Court of Appeals in San Francisco outlawed the Nativity scenes depicted on large dioramas in Santa Monica, California’s Palisades Park. Those dioramas had been erected in the park every Christmas season since the 1950s. That’s why the redeemed of the Lord should stand up for Christmas during Advent. For the Word of God promises that if we resist the Devil, he will flee from us. 29 Nov	This entry was published on November 29, 2015 at 11:48 AM. It’s filed under Holidays and tagged ADVENT, ATHEISTS, BILL DE BLASIO, BLACK FRIDAY, CHRISTMAS, current-events, MAMMON, SANTA MONICA NATIVITY SCENE, SATAN, WHITE HOUSE CHRISTMAS CARD. Bookmark the permalink. Follow any comments here with the RSS feed for this post. Older: Could the Doctrine of the Trinity Be Wrong? Good one JP. Actually, our war should begin on Immigration and the right to vote. In a free Country, anyone can become citizens and have the right to vote. Lebanon is an example. Nice, caring, Liberals who let the palestinians in and eventually, through their own process, was taken over and destroyed. Now take the U.S, It began with about 97% Christians or Christian sympathizers. Then we started letting all different kinds of religions in and they got a vote. Here is an example. Muslims have 8 kids to our 1. They also can have four wives. They come to our Country and put them all on welfare.In 30 years we are over run and by our own laws, out voted. The Muslims Koran says they need to take over the world. That kind of philosophy bars them from entering into our Country. We need to stop that. Also, people who come here should never have the right to vote. Look, most nationalities come to the U.S. and find a neighborhood with similar people. Why? They have much in common. The food, the language and many other things. There is nothing wrong with that. It is even fun to visit these ethnic neighborhoods and sample their food or crafts.Their children grow up and marry and assimilate into society. They spread out and eventually, when the immigrants stop coming the old neighborhood becomes something else. Case in point would be Woodside, Queens, NY. It was a wonderful Irish neighborhood but the Irish aren’t coming any more. Muslims don’t do that. They raise their children to hate Americans. They close off their towns to visitors. I remember going to a Muslim restaurant years ago in California. I really wanted some Hummus. The people there said there was no more and persuaded me to leave. It is only now I even realized they did not want a Christian in their Restaurant. Seeing Christmas disappear is a result of liberal thinking, liberal politicians and anti-Christian foreigners. We don’t let people who hate us and want to kill us into our homes. Why then do we let them into our Country? Ha! We secularists won the Battle of the President’s Christmas Cards decades and decades ago. Your rants are too late.